Whether you’re interested in apartments for rent in San Pedro CA or you already live in this community, you may have heard of the Battleship Iowa Museum on the Los Angeles Waterfront and realize that you might want to learn more about this exciting piece of American history. For the most part, you may drive by the LA Waterfront from time to time but never actually stop by to find out what all the hoopla is about. The USS Iowa is an important ship in American history as you are about to learn. It was built in the Brooklyn Naval Yards in New York City and originally launched on August 27, 1942. There is so much more historical significance to this important ship and we will fill you in on all of the details, plus you’ll learn more about tours, exhibits, and other exciting things about the museum. So, if you’re ready to embrace this portion of American history and learn about the USS Iowa by visiting the museum, you’re definitely in for an exciting and emotional treat. All Americans should learn about this historical ship and how it helped the US and our allies during World War II. Stick around to learn the history this great ship and so much more. As mentioned briefly, the USS Iowa was originally launched on August 27, 1942 and it was built in the Brooklyn Naval Yard. This battleship was also nicknamed and known as The Big Stick, and it was the first of the new class of American battleships built for World War II. These Iowa class ships are fast and large battleships that were originally designed to help the war effort during World War II. The ship is 887 feet and 3 inches long, and its tallest point is 187 feet above the waterline. This current version of the USS Iowa is not the first. In fact, there were three other ships named the USS Iowa in American history before this one. Originally commissioned on February 22, 1943, it immediately went to the Atlantic to help aid in the war effort. It should come as no shock to any American how much the battleship Iowa really matters and the significance that it had during the World War II naval campaign, which is the largest campaign in US history. The United States Naval war effort was located on the West Coast and thousands of servicemen and women last viewed Southern California and Northern Washington for many years before embarking upon their journey. These battleships played a significant role in providing balance for the Allied forces. Ultimately, the USS Iowa is historically important because it was the flagship of Battleship Division Seven, and it sailed to the Pacific on January 2, 1944. She provided support for aired raids on Wakde, Aitape, and Hollandia Islands and other important Japanese installations. The Iowa also served as the flagship when the Japanese surrendered in Tokyo Bay on September 2, 1945. All in all, the Iowa was then decommissioned in 1949 but then it was brought back into service in 1951 due to hostilities in Korea. The ship bombarded key targets owned by the Chinese and North Koreans at Kojo, Hungnam, and Songjin. In 1984, the ship was recommissioned for a third time. On April 19, 1989, an onboard explosion killed 47 men. They were never capable of determining the cause of the explosion, but the ship was then decommissioned for a final time in 1990 before it was docked in Richmond, California and eventually moved to San Pedro, CA, its current home. 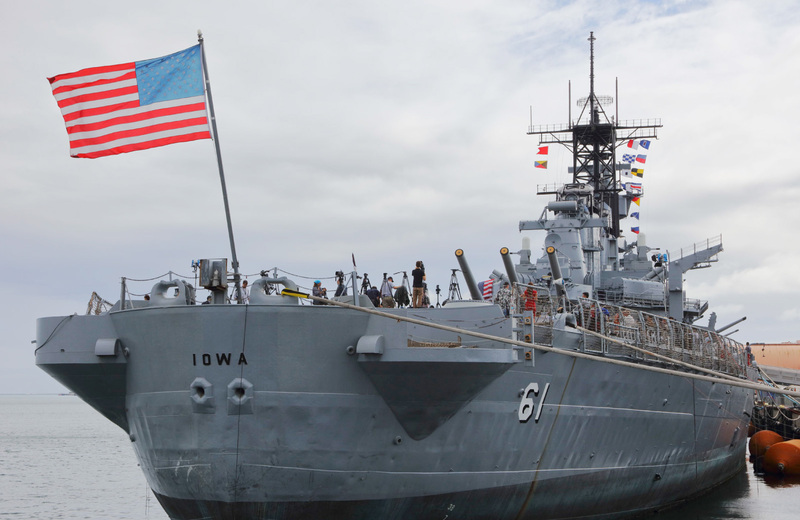 How Much Do Tickets Cost to Visit the Battleship Iowa Museum? Now that you’ve learn more about the history of this important American battleship, you may have decided to stop in for an official tour to see this amazing piece of American craftsmanship yourself. And if that’s the case, you’ll want to visit any time from 10 AM to 5 PM, because the museum is open seven days a week. The only days it’s closed are Christmas and Thanksgiving. The last admission is sold at 4 PM, so get there before then or you’ll have to come back at another time. General admission ticket prices to the Extended Iowa Experience for adults ages 12 through 61 are $29.95. With this level of admission, you’ll be able to enjoy the Extended Iowa Experience Tour plus the regular general admission tour. You’ll also be able to see the newly opened third deck attractions with this admission level, so it’s worth it to pay a little bit extra for the additional access. Regular general admission prices online are currently on sale for $17.95. This is for adults between the ages of 12 through 61. The youth Extended Iowa Experience Tour for children ages 3 through 11 is $21.95. Regular admission fees for youths ages 3 to 11 is on sale for $9.95. They also offer other great online discounts for seniors ages 62 or older which costs $14.95 for general admission. And if you are an active, retired, or former member of the US military, your general admission price is $14.95 and it costs $26.95 for the Extended Iowa Experience for current or former military members. You must provide proof of ID at the gate in order to qualify for this discount. And children two years or under are allowed to tour the USS Iowa for free.